Panic over, my new computer suddenly spat into life after I held my finger firmly on the start button for ten seconds! So here I am, breathing a huge sigh of relief and writing to you. Now, I know you only want to hear about our comings and goings in Tuscany, however, if you can just give me a few minutes of your attention, I will fill you in on my visit to England to celebrate my mother’s 90th birthday. The previous night I stayed with my mother-in-law in Somerset who is nearly eighty-nine. We converged in the kitchen early the next morning and she said, “Oh, its you June, I knew someone was staying but I could not remember who!” So it was no surprise when later that morning, my sister-in-law and I arrived at my mother’s house and the old dear opened the door and said “Oh, you look just like my daughter June!” I am your daughter June,” I replied. “what are you doing here?” she asked. 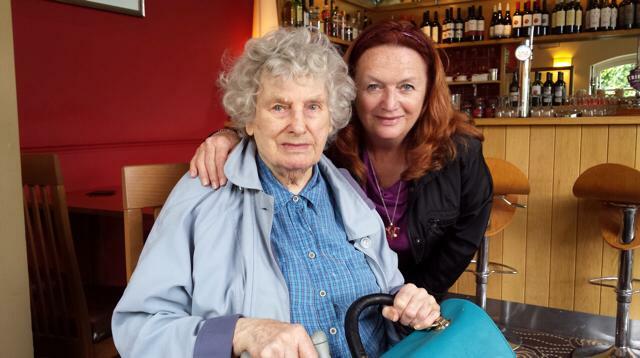 “I’m here for your birthday mum, you are 90 today…..” “Goodness gracious, is that right, well you had better come in then…..” At tea time, I caught a train from Exeter to Cornwall as I was visiting an old client who is now in her mid-eighties. I arrived at my hotel and she did not answer her phone. I then found out that the poor thing was in hospital in Plymouth and I rang her there. “Oh, hello June, are you in Italy?” “No, I am at the Port Gavern Hotel just down the road from your house; I came to visit you.” “Oh, I had a fall you know, I had forgotten you were coming……” So I kicked my heels around at the Port Gavern for two nights and found that it had been taken over by new owners. All the locals had left the bar in disgust and taken their dogs with them. So I perched on a bar stool talking to Terry the lovely barmaid and a couple of visitors from London. Nobody remembered me there either, despite my having stayed four of five times, and believe me I am not a quiet person. However, whilst I no longer drink beer I was delighted to see a row of real ales: Tribute, Timothy Taylor, Betty Stogs and my favourite Proper Job. My man would have been drooling if he had been there, and I really wish he had been. So, thank god, I returned to beautiful Tuscany where I was delighted to read in the news that, despite the Italians often being accused of racism, a group of black african war orphans had arrived to join their adoptive Italian families! This was quite simply heartwarming and I felt the tears pricking at the back of my eyes. 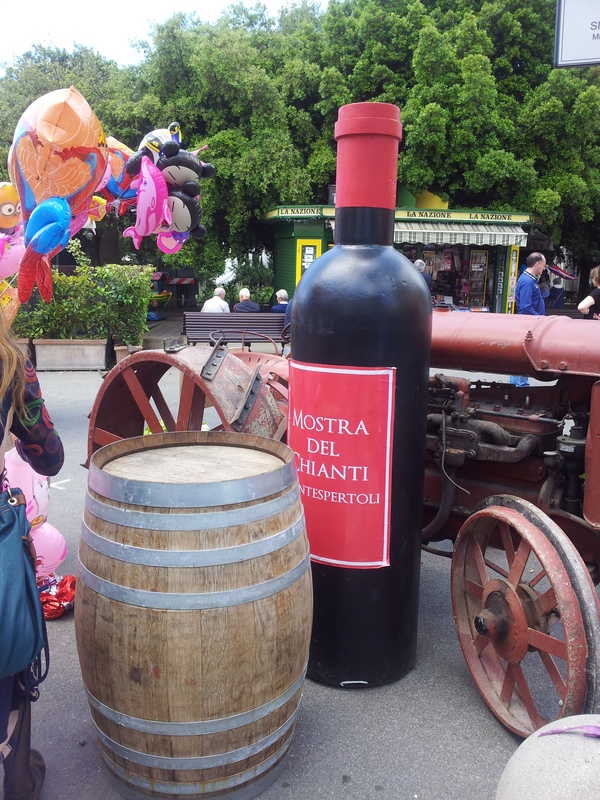 Meanwhile preparations for the annual Wine Fair in Montespertoli had been in full swing, so when my man and I arrived for aperitivi before lunch on Sunday, we were greeted by a marching medieval band and loud Italian pop songs belting out of loudspeakers. all the usual vineyards were represented under their white awnings around the main piazza, along with the rather trashy street sellers selling brightly coloured plastic toys and balloons. It is rare to meet drunken Italians, but there were quite a few, including certain friends of ours, who had obviously got started on the wine tasting at first light! Oh yes, I must give you the latest on Farty Barty. He has brought a girlie cat home to share his food! Can you believe it, he is six years old and has never done this before. She is quite confident, skinny and feral. Probably no more than six months old, so could be his daughter… We are calling her Farty Bartina. Well, I will check out the latest on Silvio Berlusconi and report back to you next weekend. He’s probably meeting a few like my mother in his current occupation. June your trip home was an enlightening one! 90 is an amazing age to reach, and I loved your MIL’s comment. We also have lots of cats hanging around our place this time of year, not sure what is going on there. Well I am back off to Australia this Sunday with my boys. My husband is staying on to finish work and we are going to hang out with my parents for a few weeks. 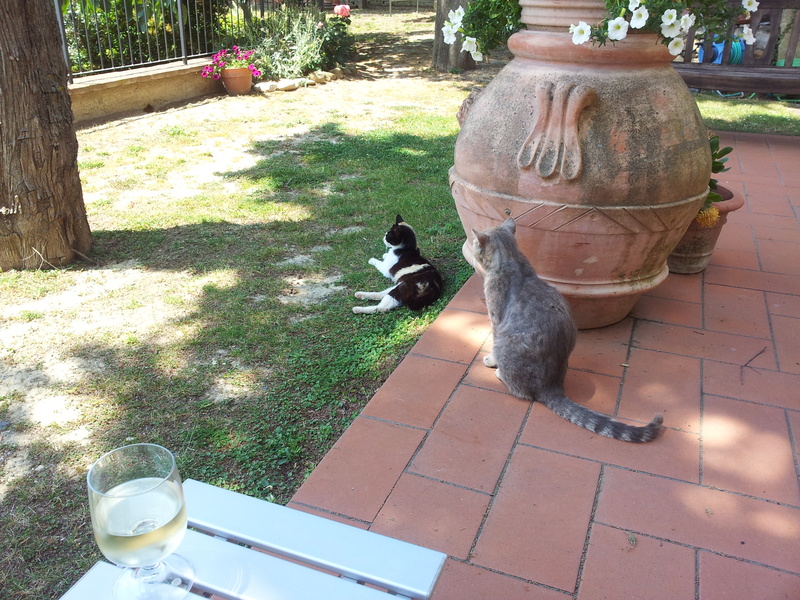 I have loved reading your blog and will continue to do so, reminding me of my year in Tuscany. Good luck with your concert, I am sorry to be missing it.